I also like the Shakespeare reference, and the cute little “carrot” pieces. So it came to live with me. I used Zoya’s new Neely as a base, a yellowish mint green that only took two coats to be opaque. I actually wore it on its own for a day, so it was nicely dry when I layered Salad Days over top. 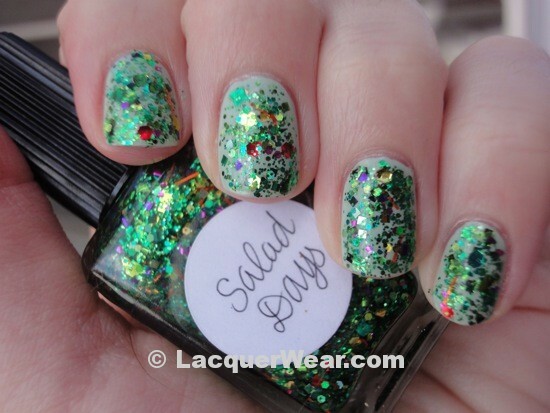 Salad Days only took one coat for this look, although there was a bit of dabbing required rather than just brushing it on. All the different glitter colors and shapes came out of the bottle easily for me. I got lots of tomatoes and carrots! It also dried pretty smoothly, so I used just one coat of topcoat over top and it was smooth enough for me, for about five days. 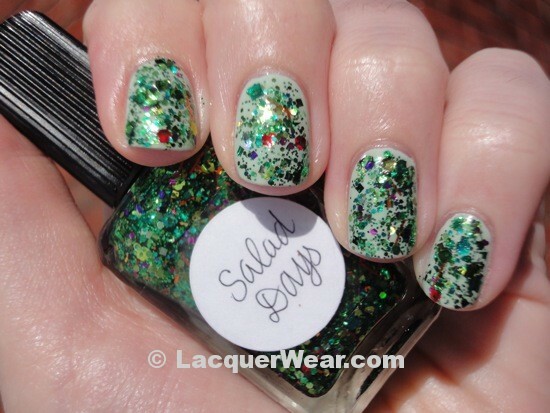 It was so sparkly and fun, and all the glitter colors popped out over the light green base. In my head I decided that Neely was sort of like iceberg lettuce at the bottom of a salad. I liked how it’s not too harsh or white, but it’s still very light. I also liked the purple, raddish-y accent pieces; they popped out more than I expected. 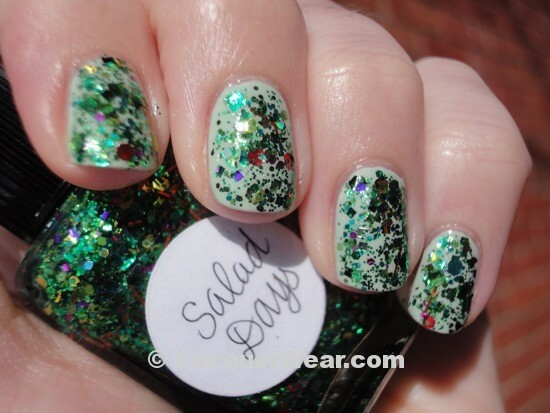 Salad Days is such a complex mix of glitter, it kind of gives a three-dimensional look on the nail. It’s pricey and only available on eBay, but at least there’s no pre-ordering and selling out drama anymore. I previously stayed away from Lynnderella polishes because I couldn’t deal with that, but the whole process is pretty easy now. For me, Salad Days is so unique that it’s worth the price.